IZHEVSK. 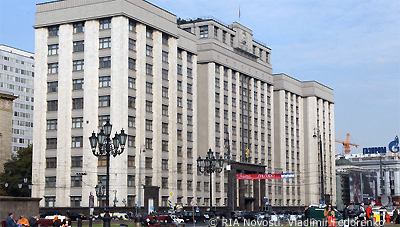 July 26 (Interfax) – The State Duma will debate bills introducing increased fines for the dissemination of illegal content and slander on social networking sites in the fall session, Andrei Isayev, first deputy head of the United Russia faction on legislative activities, said. “At the beginning of the fall session, they [the authors of legislative initiatives] will insist on the two bills being debated in the first reading,” Isayev told reporters during a working visit to Udmurtia on Wednesday. Isayev said he means two bills: a bill outlining requirements for administrators of social networking sites and amendments to the Code of Administrative Violations as regards the amount of fines. “From three million [rubles] to five million [rubles] for a private individual and from 30 million [rubles] to 50 million rubles for a legal entity,” Isayev said. “We support the concept of the bill,” he said. Isayev said parliamentarians have a number of remarks regarding the technical fulfillment of the law and these issues need to be considered. Isayev said amendments need to be made to the Code of Administrative Violations to adopt these bills, which will be debated in the fall.